Educational travel and St. Augustine, Florida, are synonymous to me. Almost all of the main attractions are historic and a great learning opportunity for all ages. Our educational journey started on the first day when we visited the Pirate Museum, but pirates are only a small fraction of the history of this place. Colonial Quarter is a re-enactment attraction located on the most adorable, must-visit streets in the entire city – St. George Street. 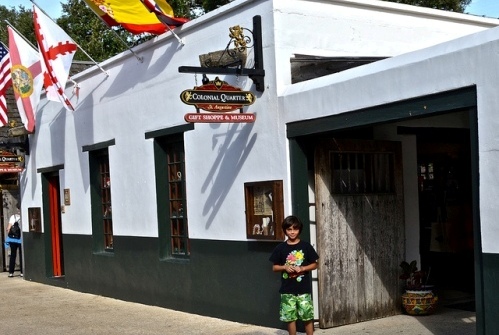 This is a pedestrian-only street that hosts a lot of the historical landmarks and the Colonial Quarters is easy to find and a perfect way to spend time learning all about St. Augustine. The museum first opened its doors in 1963 as a living museum. It used to be dedicated to teach about the time when St. Augustine was occupied by Spain. 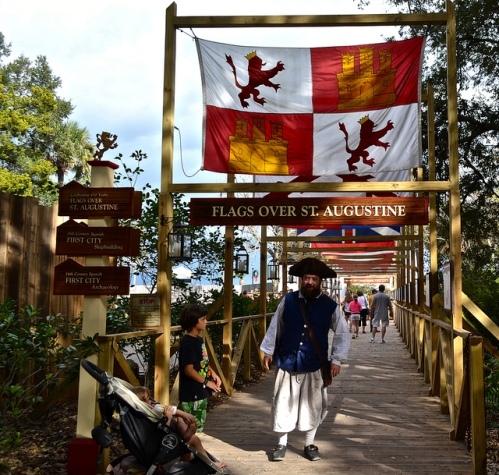 Now you can walk through 3 centuries of St. Augustine’s history. Flags over St. Augustine – This is a boardwalk where you walk beneath the flags that have flown over the City for over 450 years. It is an easy way to learn about the different countries that at one point or another took control over St. Augustine. See a 16th Century Sailing Vessel Being Crafted – But not a tiny scale one, it is a 50-foot caravel. Caravel is the original size boat that most sailors used when they arrived to the new land. Columbus’s boat was a Caravel. Our guide explained that with tons of sailors on a tiny boat it was more of a nightmare sail than the romantic sailing we learn about in schools. Experience History beneath your Feet – This attraction allows you to get a glimpse into the archaeological investigations that took place on the very ground you are standing in. Take Part in a Musket Drill – You get to learn how to lock, load and fire your 17th century replica. Climb a 17th Century Watchtower – It overlooks Castillos de San Marcos. Getting the Musket in hand was way more fun than the climb. Blacksmith Training – See how the Blacksmith forged metal into useful objects of that era. De Mesa-Sanchez House – This is a home museum that was built in the 1740′s. 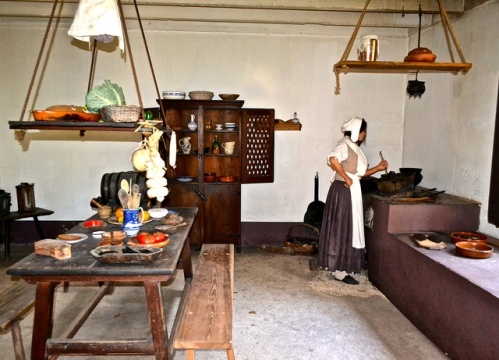 Get a glimpse as to how nobility and merchants lived during those times. Gazette Print Shoppe – Learn how to use a replica of a printing press from 1770′s. Bull & Crown Public House – It is a kid friendly bar and restaurant. There are actually two restaurants. One is a Public house and the other a Tavern. The difference between a Pub (public house) and a Tavern is that Pubs were open to everyone, taverns only to the army and infantry. Soldier House – An opportunity to look and feel how the soldiers lived, check out their bed and see how their women’s days were filled. Hours: Seven days a week – 10:00 a.m. to 6:00 p.m. The Colonial Quarter Tour– A tour guide shares tales of St. Augustine’s past as you’re led through exciting activities like musket firing and cannon drills – this is included in the price of the entrance.